When the buzz around facial sprays/spritzers/mists began I have to say, I was a little sceptical. Where these things just glorified water? Well they basically are glorified water, but I'd definitely say they serve a purpose, I've tried a couple of these sprays from various brands and got on well with them so I was more than happy to give the Love Your Skin London Floral Hydrating Spritzer* a go. First off I love the simple handbag friendly packaging of this, which may sound silly, but as this is a handbag product the plastic bottle and extra secure cap make it pretty durable which is exactly what handbag products should be in my opinion! That aside the main thing I love about it is the ‘spritz’ itself. 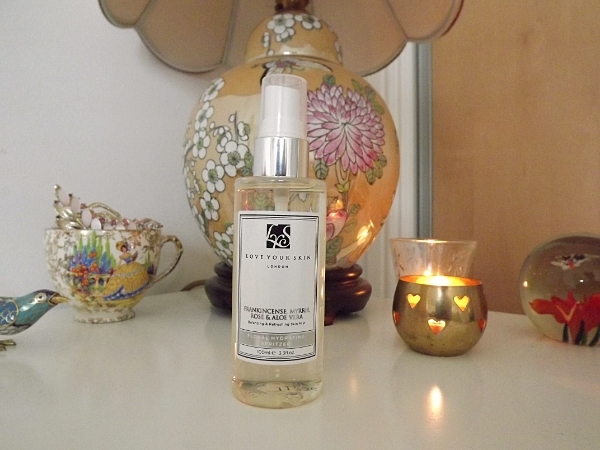 The way this sprays out onto the face really is like a mist, whereas in some I’ve tried before its all been a bit more of a splash than a spritz, its a lovely fine concentrated mist that refreshes and tingles the skin. The mist boasts ingredients such as Frankincense, Myrrh, Rose and Aloe Vera which combine to create a really calming herbal scent that’s perfect for when your needing a little pick me up. The aim of this is basically to be used as a toner, or throughout the day to refresh and hydrate the skin, and it’s also quite nice to have in warm or stressful situations. I wouldn’t say this is an essential, but it is a nice product to have in your handbag especially if your travelling a lot during the day or in hotter climates. I’m off on holiday in two months and this will most definitely be coming with me as it is extremely refreshing. Have you guys tried anything from this brand? Let me know your thoughts on facial mists, do you think they are worth the hype?